This utility enables you to plan potential routes and - if you are logged in - to save the data too. 1) To plan a route drag the marker to your start/end point & Zoom in with the [+] button or left double clicking. 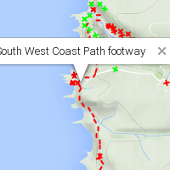 2) Select "locate", "path finder" or "OS maps" to find route information. 3) Drag marker to the next selected point and press "locate" again. This time the routes from the new point back to the already located hills and places are shown. Press "locate" again to reveal new points.